King Edward Hotel hosts around 200 weddings every year and we have been fortunate enough to photograph many of them. It is not the sheer number of weddings a Toronto wedding photographer shoots every year. It is the quality of the images delivered to our clients clients getting married at King Edward Hotel that consolidates our position among the top wedding photographers at this location. This particular image was taken on the lobby located on the second floor at the famous five-star hotel in downtown Toronto. Truth be told, this is not an original concept in the bride asked me to create this image she saw on a different Toronto wedding photographer's website. However, I to that concept and drastically improved it to give my clients a beautiful photographic image that is now hanging on their wall. How Did I Create this Splendid Image? This unusual image portrays the bride and groom holding hands while standing behind the columns across from the Palm Court. You will never be able to tell, but this is in fact a composite image. First, I took a darker image using only the ambient light so I can eliminate all the distractions. In photography, that is called the plate. Next, I invited the bride and groom to take their positions and asked my second shooter to hold the light. In post production, I blended the two images so that only the bride and groom are lit as if a spotlight was cast upon them. I have not seen this of mastery achieved by any other photographer who shot at this hotel. Besides the complex technique used to achieve this photograph, its value consists in its composition. The bride and groom are placed towards the right of the frame between two columns. There are a few composition elements that make this image unique. First the repeating pattern created by the columns is very appealing to the human eye. Even more, the pattern is broken by the presence of the bride and groom, breaking the pattern emphasizes the importance of the subject in this picture. As a side note, creating this image was even more difficult than it looks because of the wedding guests enjoying the cocktail hour in the Palm Court. The created a distraction as many of them try to strike a conversation and watched closely every single of my movements. In order to accentuate the bride and groom's importance in this wedding photo, I made sure they are the brightest part of the frame. To capture the shot I used a 35mm 1.4 lens shot at F4.5 to ensure that both the subjects and the columns are in focus in this picture. Post processing was not only difficult because I had to carefully combine two images but also because of the distracting elements in the background. Unfortunately, many of the wedding guests were roaming around so my only option was to remove them in the post production phase. Another challenging aspect was to blend the natural light coming through the beautiful King Edward skylight with that cast by the tungsten lights. Finally, after I cropped this photograph in a cinematic way I knew I had a perfect image. 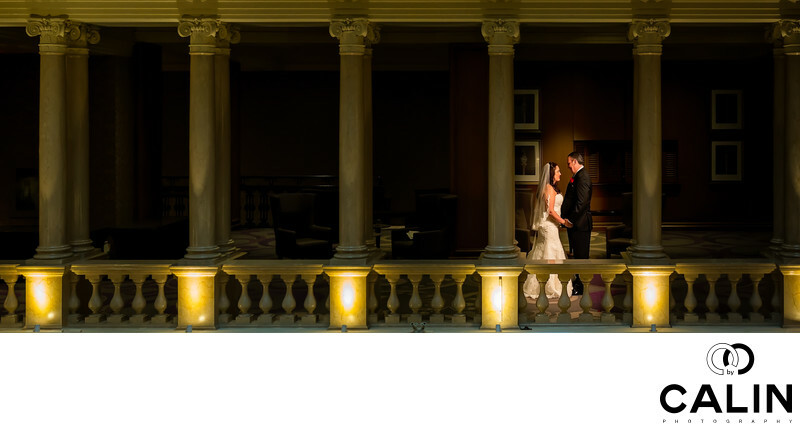 It is not a secret that I love photographing King Edward Hotel weddings. What makes this wedding venue one of my preferred locations in Toronto? First, the hotel boasts lavish interiors and plenty of art pieces that can be incorporated in my wedding pictures. The walls are covered by splendid wallpapers, wooden panels and artwork that constitute perfect backdrops for your photographs. On your wedding day, you will wake up in one of the beautiful rooms in the hotel and expect to be pampered by the professional staff. The service this hotel provides is impeccable, also shown by its five-star rating. Both trip advisor and Google ratings are among the best in the area situating it at a 4.5 stars. If that is not enough, one of the hotels wedding planners and catering managers will make sure that your event will be a success so you can rest easy and enjoy your Big Day.